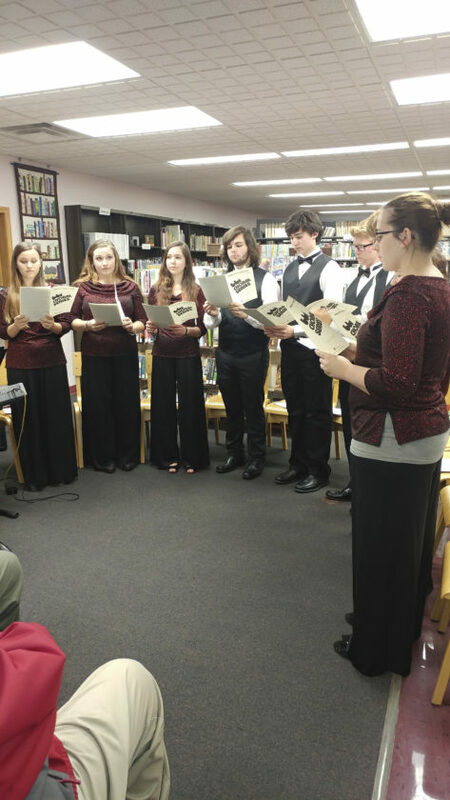 Submitted Photo Cassadaga Valley Central School Advanced Chorus students performing at the library’s 2017 Open House. The Sinclairville Free Library Board of Trustees invites their donors, patrons, volunteers and supporters to the library’s “Thank You” Open House to be held on Thursday, Nov. 8 from 6 to 7 p.m. The Cassadaga Valley Central School Valley Minstrels will perform at 6 p.m., with refreshments to be served following their concert. This event is free and open to the public, and is one way of saying “thank you” to the community for its support. The local library belongs to everyone, with free access to books, DVDs, magazines, newspapers, local history, audiobooks, ebooks, games and puzzles for young and old. Life-long education is offered through a variety of programming for all ages, the library building is available for community groups to meet, and it provides a safe place for anyone who needs it. The community’s generous investment in this local library is appreciated by one and all. Come to the library on Nov. 8 as the trustees and staff express their appreciation for the community’s support. The library’s Annual Appeal to raise funds for the coming year is underway. Donations may be made through PayPal on the library’s website at www.sinclairvillelibrary.org, or by mail at PO Box 609, Sinclairville, NY, 14782. Call the library at 962-5885 or message by email at sincfrlb@gmail.com with requests for materials and to request information on library programs and services.